Just started playing chess again after about 30 years, learning the game again with my 9 year old. After purchasing a cheap set from a local toy shop and discovering we really enjoyed the game, decided to buy a 'nice' set. After searching high and low online, I kept returning to this set as it seemed to offer the best balance of quality and price. I think it was a good choice, because I couldn't be happier with this set. The pieces are weighty, stable and beautifully carved. The knights are aggressive looking beasts and particularly impressive. My wife is quite happy to have it permanently on display because it looks so nice - in fact, she made a special place for it on the coffee table. The board has very nice veneers, and I like the simple design and slim edge frame as it leaves more space for the squares. Even the base is nicely finished, although it does benefit from the optional felt pads. 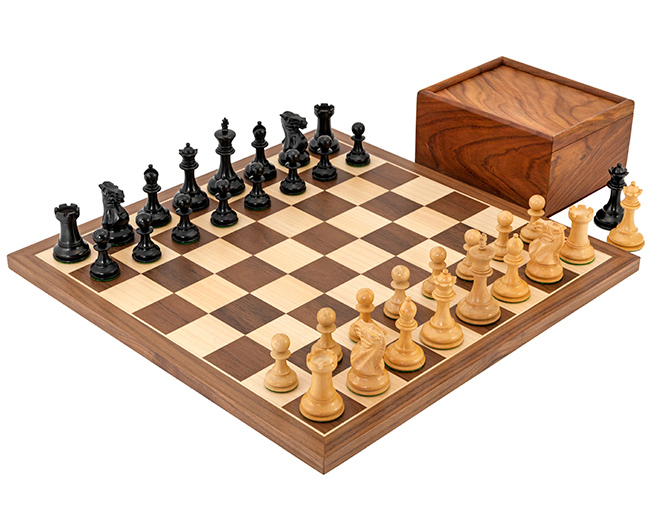 I'd say the size of this set is sensible choice for people who don't want their chess set as the focal point of a room. It certainly isn't small, despite being described as such. I measured the board squares as exactly 1 3/4 inches - slightly larger than the description, and correctly proportioned for the pieces. The storage box is also very attractive, with a red felt base and interior. I like the way the sliding lid snaps securely shut via a magnetic latch. It matches the board colour a more closely than in the photos and is higher quality than I expected. This set certainly increases the inclination to have a game, and makes the game all the more enjoyable while playing.